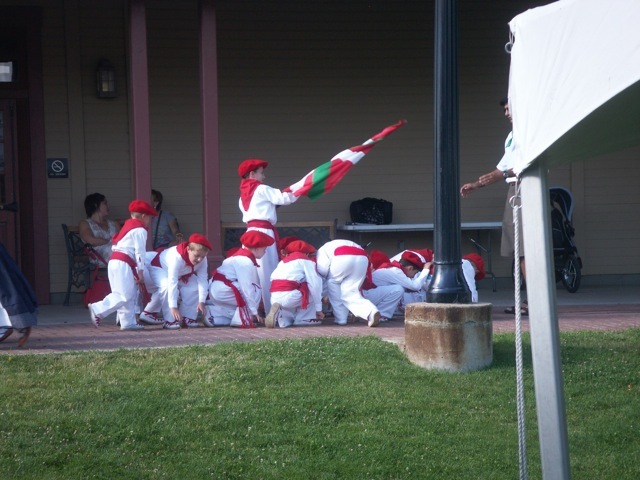 For those that don’t know, Jaialdi is the big Basque festival held every 5 years in Boise, Idaho over St. Ignatius weekend (the last weekend in July). 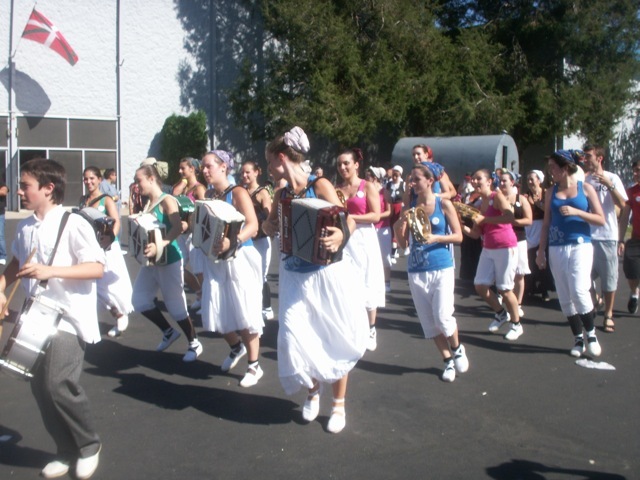 It brings Basques from all over the world together for a weekend of dance, music, sports, drink, and fun. In fact, many come from the Basque Country itself, drawn by old friends or the reputation of a big party in the US, including my dad’s brother Antonio and his wife Eli, the first time they’ve come to the US. We didn’t make it to every event but we did our best. We started with Sports Night, on Thursday. I went with my brother, my dad, and Antonio and Eli. It was held right down town, across the street from the Basque Block in the same arena that the Boise hockey team plays in. It was laid out with logs for the aizkolariak and stones for the harrijasotzaileak, as well as some other typical events. Most I’d seen before, but there were a few, such as the relay carrying the heavy sack, that I did not. One event, in which contestants try to pitch a bale of hay over a bar that is raised with each successful toss, was new to my uncle. He had never seen that event in Bizkaia. 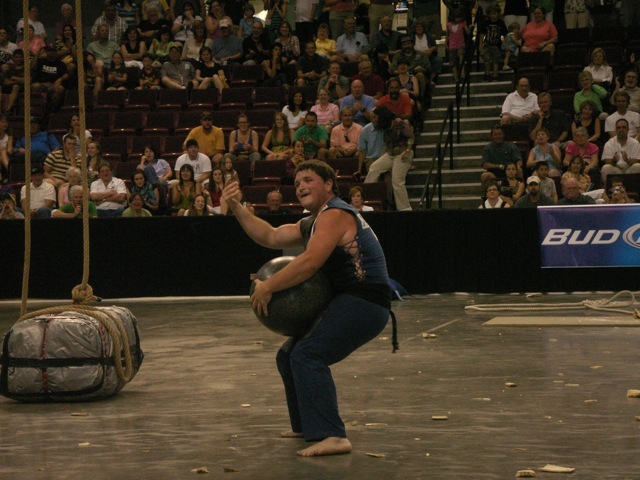 At one point, two harrijasotzaileak “competed” with one another, each carrying a 100 lb stone around the arena. One had to quit quickly, possibly having pulled something. The other, though, hammed it up, engaging the crowd as he stood there, holding this huge stone in his lap. 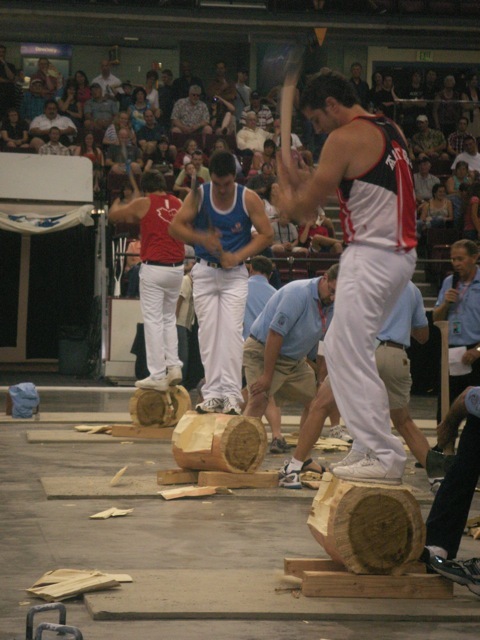 When the night was over, children rushed into the arena, finding wood chips for the athletes to sign. It was an interesting perspective, watching these events in this crowd. On one side, I had my uncle, who is as much of a sports fan as any. However, one thing you don’t realize as a Basque-American watching these sports, which we see only every so often in typically heavy doses, is that in the Basque Country, this is every day stuff. As such, they don’t have such concentrated showings of it; festivals might have a few sporting exhibitions, but not hours worth. My uncle was getting a little bored with it, though he of course got into it whenever things got exciting. On my other side were some non-Basques who I guess had thought they’d check out some local color or something. It was interesting and a bit odd hearing their commentary. They sort of mocked what they saw, commenting on how simplistic the sporting events were, comparing them to the “sophistication” of American sports. It showed they didn’t have much of a true idea of what the Basque Country is about and how this is one slice of the sporting scene in the Basque Country, maybe somewhat analogous to a rodeo in the US West. 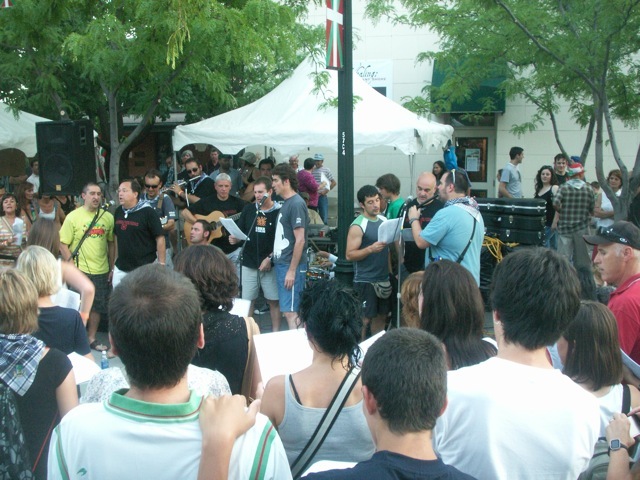 On Friday, after attending NABO’s Annual Convention at which the New Mexico Euskal Etxea was officially accepted as a member, we headed to the Basque Block to check out the festivities. And it was completely packed, from one end of the block to the other! I must imagine that this was the best attended Jaialdi to date! There were so many people that it was difficult to maneuver through the crowd. It was that way Thursday night as well, though during the day, the heat added a level of discomfort. But, people were singing, dancing, drinking and eating — generally having a wonderful time. Again, I wondered about the demographics of the crowd. It felt like there were just as many people who maybe had no Basque ties but were looking for a good way to spend the weekend. This is a testament to the reputation of the Basques in Boise. 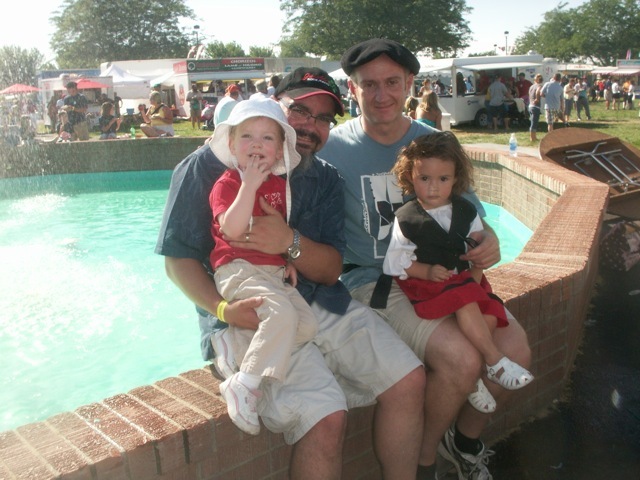 During the weekend, especially during the day, festivities moved to the Fair Grounds. The official opening ceremonies were on Saturday morning and, as a representative of NMEE, I was asked to carry the New Mexico flag in the procession. While waiting for things to start, I was able to wander a little behind the scenes, where the various dance groups were organizing themselves. While adults shepherded children and tried to get them lined up in some semblance of an order, some of the groups did last minute practices of their dances. Compared to when I was a kid doing these dances, there were a lot more groups with a lot more different costumes. 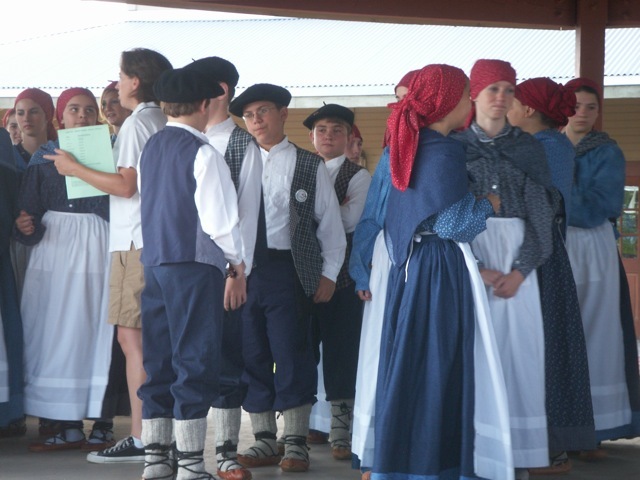 Especially noticeable were the girls’ dressed in blue, in contrast to the typical red, black, and white. The opening ceremonies tried to bring together all of the groups who were to perfo rm over the weekend, including the Klika from Chino, a number of groups from the Basque Country, and of course all of the dance groups from the US. It was an awesome beginning to the weekend. After that, all of my official duties were over, so I just enjoyed Jaialdi as much as I could. My family joined me when they were able, and overall we had a wonderful time. 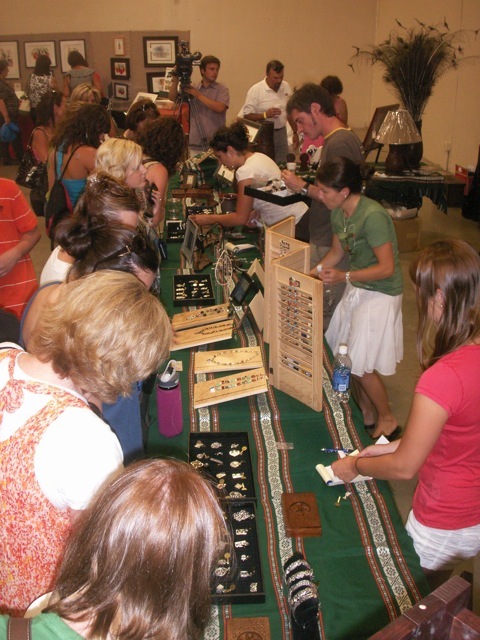 This year, the vendor booths were moved inside to escape the heat and that was a superb change. I remember last time that the heat (it reached 100 every day) and the wind kicking up the dirt at the fair grounds sometimes made being outside a bit unpleasant. By moving the vendors indoors, they made that part much better than it had been. A number of friends were manning booths, so it was great chatting with them, especially a few who I had only known before via Internet, not in person. Truly, the best part of Jaialdi is seeing old friends and meeting new ones. We ran into a lot of friends from our days in Seattle, who have a group that is going very strong, thanks in large part to the influx of new Basques into the area, who I had the great pleasure to meet. We also ran into Joseba Etxarri, who is still a big fixture in many Basque festivals in the US. One notable absence was Aita Tillouis, who passed away recently, but who was always a big presence in so many Basque gatherings. But, it is the friends that make Jaialdi such a wonderful experience and, I have to admit, one of the things I lamented just a little. Jaialdi has grown so big, it is less intimate, with so many people that you don’t bump into a friend around every corner, at least not as much. Maybe for people who live in Boise it isn’t that way, but it was a little more that way for me than it had been in years past. That said, it was still an awesome weekend and I’ll definitely be attending the next one in 2015.